Climate change is causing increasing damage as storms become more intense every year due to warmer waters and military bases are taking a big hit. Looking back on the extensive damage wrought by Hurricane Michael in the 2018 Hurricane Season, the mayor of Panama City, Greg Brudnicki said he had never seen a storm like it after 55 years of living there. The Category 5 Storm destroyed many areas and neighboring Mexico Beach was virtually wiped off the map. Over 30% of Panama City’s economy comes from Tyndall Air Force Base which is to the east of the city and the base suffered catastrophic damage that it still has not recovered from eight months later. Extreme weather events like Hurricane Michael are becoming a huge problem when it comes to the budget of the Pentagon due to the effects of climate change. 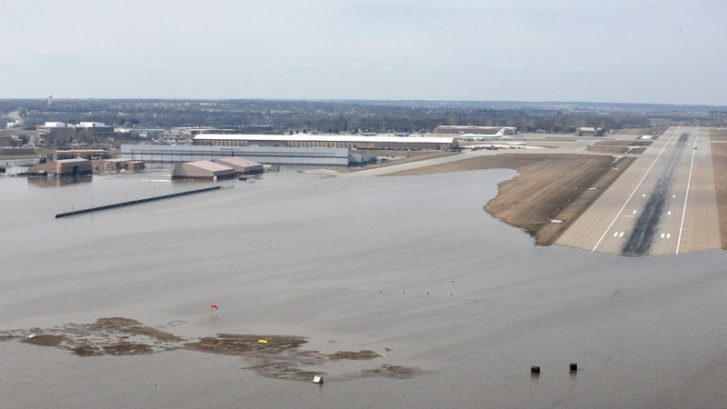 Numerous military bases have been affected by these events including Offutt Air Force Base in Nebraska which was inundated by the recent extreme flooding. The Air Force recently asked for $5 billion to cover repairs just for Tyndall and Offutt, which were totally not ready for the severity of Hurricane Michael and the Midwest flooding. Despite the ridiculous statements of climate change deniers, both of these weather catastrophes are distinctly linked to climate change. The historic intensity of the October Hurricane Michael due to unseasonably warm waters in the Northeast Gulf of Mexico and the late heavy winter storms coupled with early warm weather caused the flooding in the Midwest. John Conger, the director of the Center for Climate and Security, stated that the $5 billion requested “is more money that the Department requested last year for all of its hurricane recovery.” Hurricanes Florence, Harvey, and Maria from 2017 impacted the Department of Defense infrastructure less than the disasters of 2018. Pentagon officials said recently that due to the extensive repairs needed at Tyndall they must get at least $1.2 billion by the first of May or the base may have to stop all work. Because the expenses for the repairs at Offutt and Tyndall has come from other operating budgets, projects at over 60 Air Force Bases in 18 states may be cut and almost 20,000 pilot training hours eliminated to adjust for the money that has already gone out. The fact that the current sitting President of the U.S. is himself a climate change denier only exacerbates the issue, even with military officials telling him that it is a very real and present danger to our National Defense. The Trump administration has filled its National Security Council with climate change deniers that refute the work of thousands of established scientists and are opposing advice and intelligence from security experts and military officials. Some of our elected leaders have been extremely theatrical in their denial of climate change with Representative Rob Bishop of Utah eating a hamburger while talking to reporters and saying that the Green New Deal is “genocide.” Senator Mike Lee, also of Utah said that climate change could be fixed by Americans having more babies. Incidentally, one of the bases scheduled for budget cuts in Hill Air Force Base in their district. It should come as no surprise that both of these politicians are Republican. Even though Utah has not been directly affected by the latest extreme weather events, the district that Lee and Bishop serve could be impacted financially due to the effects of climate change on other military bases around the country. They both claim to be staunch supporters of the military and of Hill AFB in particular, but their actions say otherwise. According to climate scientists there is no end in sight for the continued increase in extreme temperatures that are causing the extreme weather events. The NOAA stated that we would see weeks of extended flooding in the Midwest, and we have, with the flooding extending into South Dakota as well. Heavy rain is becoming more commonplace which is resulting in flooding never before seen by anyone in as much as 500 years. Warmer waters in the Atlantic and Gulf of Mexico in particular are causing more intense hurricanes. The Pentagon sent a list of military bases they thought to be most at risk from climate change and neither Offutt or Tyndall were on it. The military in’t going alone with the climate deniers from the White House and others on Capitol Hill. Due to the unforeseen expenses they are facing from the extreme weather events of the past year military officials are now admitting that it will only get worse. 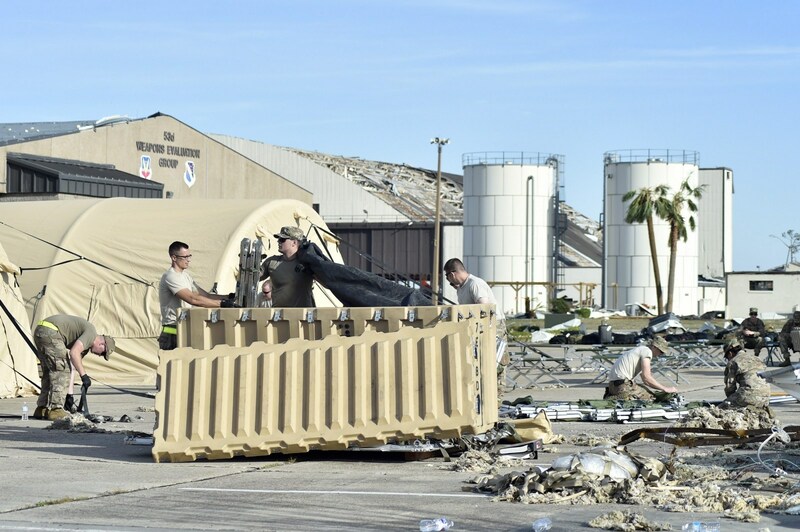 The Air Force has stated that Tyndall will be rebuilt as “the base of the future” in order to withstand the high winds and storm surges of future storms like Hurricane Michael.